Promedio de 5/5 out of 32 voto(s). 16 year-old Kudo Shinichi, a famous High school detective, treats his friend, Mori Ran to a theme park named Tropical Land. After solving a murder case that occured on the same day, Shinichi notices and tails two people in black. However, one of them notices Shinichi and knocks him out. Instead of killing him, they gave him an untested poison that was supposed to kill him yet leave no traces. However, instead of killing him, it shrunk him into a 8 year old boy. 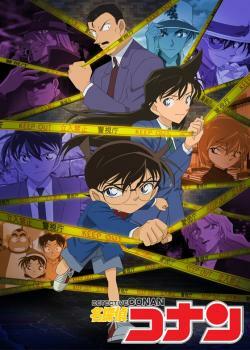 Shinichi now goes under the name Edogawa Conan. Detective Conan 1017 : No es Mike, sino..
Detective Conan 1016 : Señal de "Prohibido aparcar"
Detective Conan 1008 : ¡Ves! Detective Conan 1006 : ¡Estate quieto! Detective Conan 999 : ¡No es sólo un colgante! Detective Conan 998 : ¡Busca el colgante del móvil! Detective Conan 995 : ¿No lo sabes? Detective Conan 993 : ¡Espera un momento! Detective Conan 991 : ¡Las manos quietas! Detective Conan 975 : ¡¿Un verdadero detective tokiota?! Detective Conan 967 : ¡¿Imposible de descifrar?! Detective Conan 929 : A Hose-Swinging Murderer?! Detective Conan 915 : Heading To Mt.Saijo..! Detective Conan 890 : High-Velocity Blood Splatters. Detective Conan 887 : The Wiretapper. Detective Conan 886 : The Wiretapper. Detective Conan 818 : Mystery Train! Detective Conan 814 : Conan-Kun, Right? Detective Conan 791 : Do You Not Remember? Detective Conan 778 : Which One is Great(er) Detective? Detective Conan 773 : Possible Sniping! Detective Conan 771 : Lets Hear Your Brilliant Deduction! Detective Conan 765 : Ramen is So Good. It's To Die For..
Detective Conan 710 : Raise & Then Lower? Detective Conan 501 : Follow the Target! Detective Conan 483 : Unlocking It! Detective Conan 478 : Immortal! The Institution is Solved! Detective Conan 477 : Magical Instrument! Uncover the Mystery of the Diamond! Detective Conan 468 : A Wish to the Star! Detective Conan 431 : The Invisible Man Appears! Detective Conan 404 : Be On Guard on a Sweet Date!! Detective Conan 219 : Go On, Sonoko! Detective Conan 95 : The Great Detective of the East Appears! Detective Conan 82 : Follow the Voice!! Detective Conan 71 : I've Finally Found You!! Detective Conan 68 : Shinichi's Sweetheart!! Detective Conan 67 : The Secret of the Name!! Detective Conan 45 : The Karaoke Killer! Detective Conan 44 : The Identity of the Murderer! Detective Conan 43 : The Attack in the Dark! Detective Conan 41 : The First Victim! Detective Conan 36 : Code Sheet Obtained!